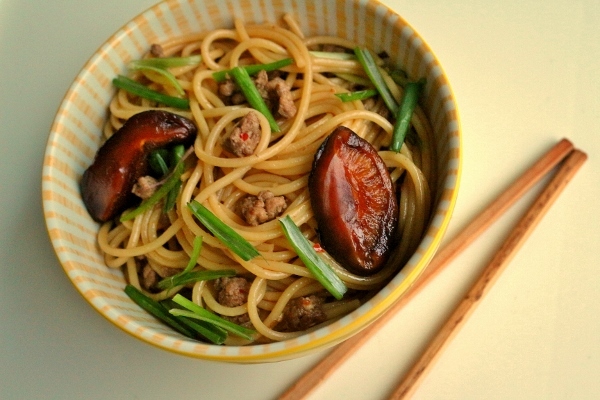 Dan Dan Noodles is a classic Sichuan dish consisting of spicy noodles and stir-fried ground pork. I've been eyeing the traditional recipe in my copy of Every Grain of Rice (it's the cover photo! 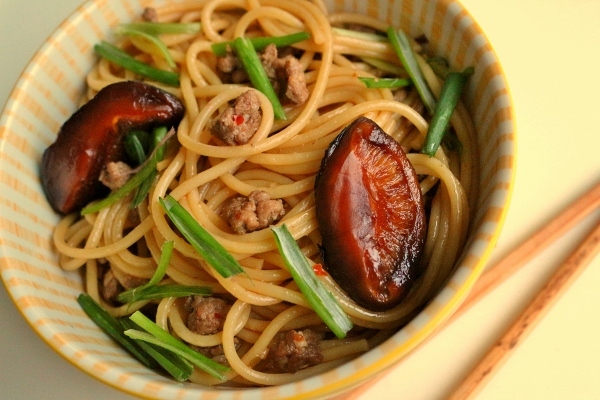 ), but was particularly intrigued by a twist on the recipe featuring sauteed shiitake mushrooms. I discussed this shiitake-inclusive variation in my recent review of Shroom. 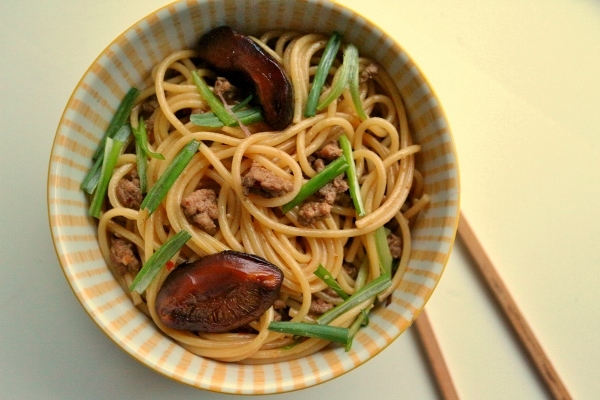 I would happily attempt the classic version in the future, but my love of mushrooms will likely win out, making these Dan Dan Noodles with Shiitakes and Pork even more appealing. 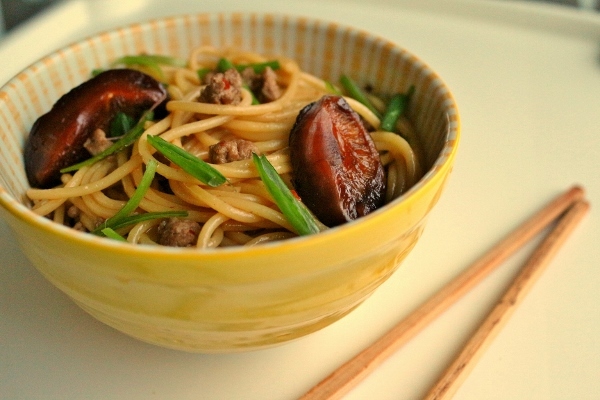 As with nearly all Asian wok-based recipes, this noodle dish comes together very quickly. It's a matter of stir-frying the "sauce" components, and boiling the noodles. I advise you to do all your prep work and measuring in advance, and then heat up your wok. The meal will be ready before you know it, and your house will smell insanely good by the time these noodles hit your plate. They are a bit on the spicy side, which I love, but if you're a fan of spice you can definitely go to town with the chili oil. I definitely recommend making your own so you can have some of the actual chili sediment to include, as opposed to just the flavored oil. I actually opted to make pickled Swiss chard instead of mustard greens (simply because I already had Swiss chard on hand). I think these pickled greens do a great job of cutting some of the spicy/oily quality of the sauce. I didn't photograph my dish with the pickled chard, only because it made my dish look a bit crowded, but I do recommend including that step in your preparation because it's a wonderful accent to the noodles. To make the pickled mustard greens, bring a large pot of water to a boil (you can use it for the pasta afterward). Add the kosher salt. Blanch the mustard greens in the water for 2 minutes. Get a bowl of cold water ready. Plunge the mustard greens into the cold water to stop the cooking. Once cool, drain the greens, squeezing out all the water with your hands. Bunch of the greens and chop into bite-size strips. Put back in the empty bowl, pour the rice vinegar over the top, mix well, and let it sit for 30 minutes while you work on the rest of the dish. To make the pork-shiitake mixture, heat a large skillet or wok over medium-high heat. Add 1 tablespoons of the oil. Add the shiitakes and salt. Panfry the shiitakes until they kick off their moisture and start to brown, about 5 minutes. Add 1 tablespoons of the soy sauce, sugar, and rice wine and simmer until all the liquid evaporates. Transfer the shiitakes to a bowl (you may want to reheat these again right before serving). Add another 2 tablespoons oil to the pan and then the pork, breaking it up as you fry it. Once all the pink is gone, add the ginger, garlic, the sliced white part of the scallions, and the fermented flour paste. Fry for 1 to 2 minutes. Add the remaining 1 tablespoon soy sauce, mushrooms stock, black vinegar, and chili oil. Simmer for 5 minutes, and then keep warm. Squeeze all of the rice vinegar out of the mustard greens and set aside (you can reuse the rice vinegar for salad dressings; just refrigerate it for up to 3 weeks). Cook the noodles according to the package directions. Drain the water from the noodles when they are al dente. Pour the pork sauce over the noodles and mix well. Serve each person a portion of the noodles, and top with the shiitakes, some pickled mustard greens, and julienned scallions. 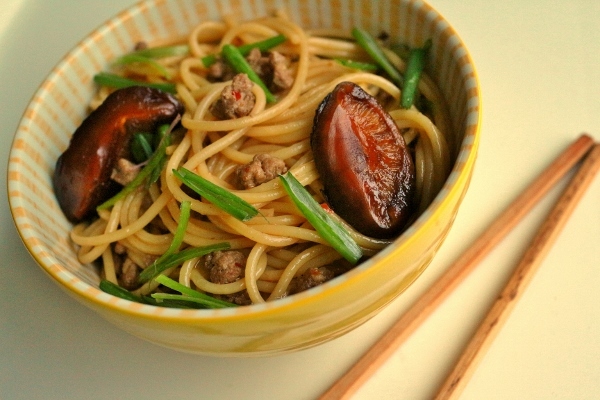 Drizzle some more chili oil on and around the noodles and serve more at the table.